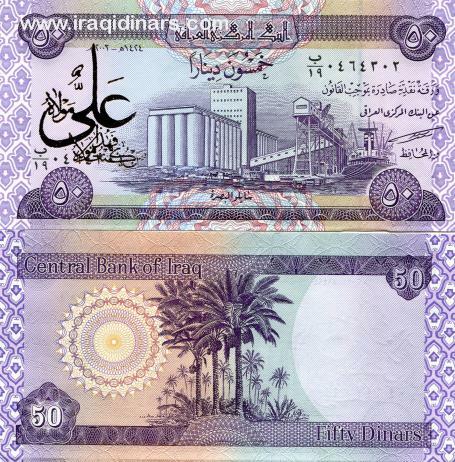 IRAQ DINAR 2003 RARE OVERPRINT NOTE - in UNC condition - RARE 50 Dinar Denomination. This is a lovely Uncirculated Bank note in Crisp Condition . 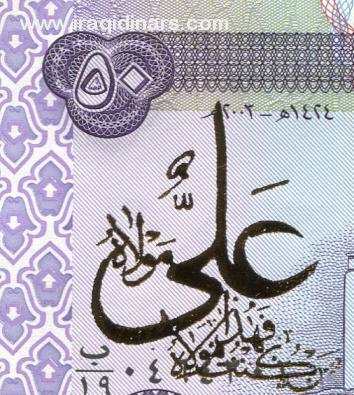 We show two scans , one of the common Iraq 50 Dinar note and the other with the overprint ARABIC IN GOLD ON THE TOP LEFT HAND CORNER , translated it says "ALI" who was the brother of the prophet Muhammad , it is believed to be an Iranian overprint against the newly liberated Iraq and the new currency that was issued . A one of a kind item and very collectible .